I love the tango! But is so not something I could wear in anything other than, say, nail polish. Pale redhead + tango? No bueno. In decor, though, love it! Remember when we painted those IKEA chairs orange for our aqua and orange kitchen? Anyway, D, did you happen to hear about last weekend's bike ride across NYC? 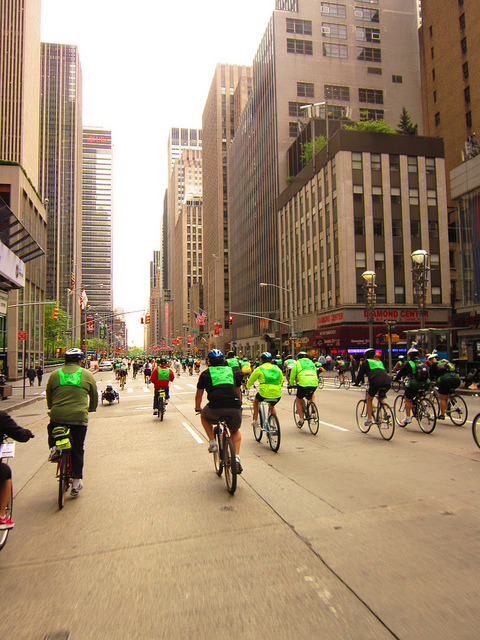 It's an organized bike ride of 40 miles across all 5 boroughs. They even close the streets to all cars! This year, over 30,000 bicyclists participated. Including Nick and his dad! While I think everyone knows that biking isn't really my thing, this looks seriously fun. First off, its a bike ride not race, so there are people of all ages and speeds and its a hugely family affair, which I think is really cool. Also, while watching the riders spin by in central park I kept thinking how much FUN it must be for the new york riders to have the road car-free! What an experience. Nick said it was really awesome going over the bridges. But most definitely a work out. The bridges are steep!